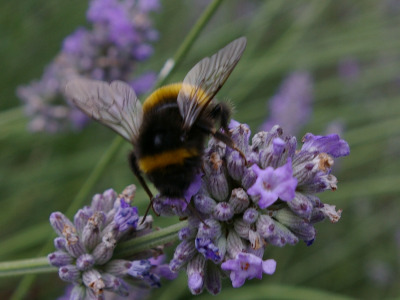 If you are thinking of purchasing a box of bumblebees for your garden, please read this first. There are commercially reared bumblebees for sale not only available to farmers and growers, but also for gardeners. 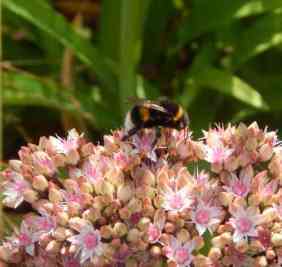 These days, in the UK for example, one can sometimes see boxes of bumblebees for sale in advertisements in gardening magazines and you can buy bumblebees from on-line stores. In a study: The Trojan hives: pollinator pathogens, imported and distributed in bumblebee colonies by Peter Graystock et al, (publ. 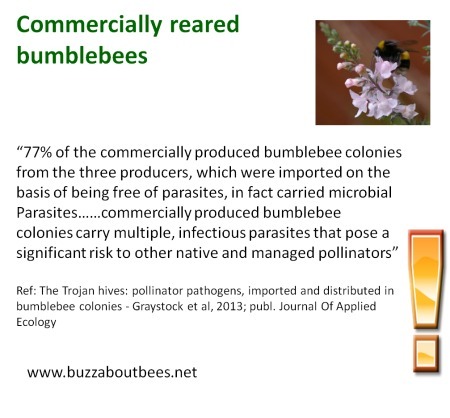 Jul 2013, Journal of Applied Ecology)(1); scientists found that bumblebees reared for commercial sale in many cases, were carrying pathogens. Scientists used molecular methods to examine the occurrence of parasites in bumblebee colonies that were commercially produced in 2011 and 2012 by three producers. They then used controlled experiments to determine whether any parasites present were infectious. They found that 77% of the commercially produced bumblebee colonies from the three producers, which were imported on the basis of being free of parasites, in fact carried microbial parasites, with five different parasites being detected across the total sample of bumblebees, and a further three in the pollen supplied with the colonies as food. Their experiments demonstrated that at least three of these parasites were infectious to bumblebees with significant negative effects on their health. Furthermore, at least four of the parasites carried by commercially produced bumblebees were infectious to honeybees, indicating that they may pose a risk to other pollinators as well. Over a million commercially produced bumblebee colonies are imported annually on a global scale for the pollination of greenhouse crops. After importation, they interact with other pollinators, with an associated risk of any parasites they carry infecting and harming native bees. They conclude: The results demonstrate that commercially produced bumblebee colonies carry multiple, infectious parasites that pose a significant risk to other native and managed pollinators. More effective disease detection and management strategies are urgently needed to reduce the pathogen spillover threat from commercially produced bumblebees. Are the bumblebees for sale in garden centres, in magazines, and available on line, potentially already infected with diseases that put wild species at risk? National and supranational regulations are supposed to prevent this, and commercially produced bumblebee colonies are accordingly, now often sold and imported as being parasite-free, but it's looking like the system is not working.